I wouldn’t have thought I’d write two posts in a row about homemade ice cream, but here we are. This weekend didn’t go as planned; I was supposed to travel to Cleveland with my boyfriend to celebrate his birthday with his family, but alas, severe weather got in the way. We ended up staying in New York and making some impromptu plans. One such plan involved brunch with friends in Brooklyn, during which I was reminded that my boyfriend’s favorite cake is ice cream cake. Needless to say, I have trouble hearing that someone has a favorite dessert without instantly wanting to make it, so I committed to making an ice cream cake this weekend. Since there would only be two of us enjoying it, I decided a two-layer cake was a bit much and settled on an ice cream pie. I brought out my old ice cream maker and churned a quart of delicious cinnamon dulce de leche ice cream, which I poured into a graham cracker crust based on this easy as pie (haha) Martha Stewart recipe. Does the photo convey the deliciousness? It was SO good. And I’m glad to say the leftovers should last til this weekend, when we reattempt our trip to Cleveland. 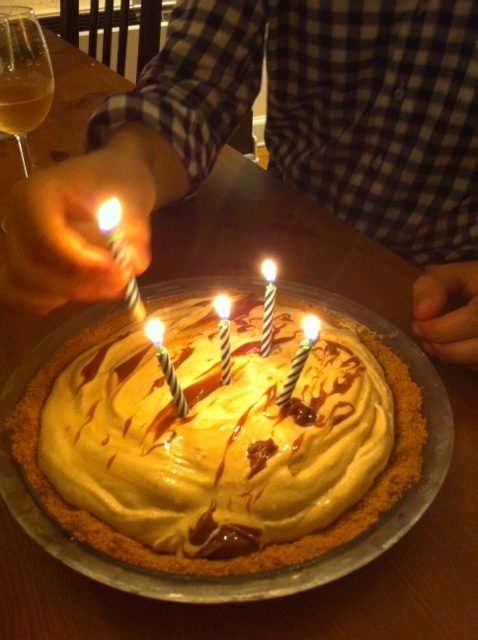 This entry was posted in New York City, Uncategorized and tagged baking for a birthday, baking for good, cinnamon dulce de leche pie, graham cracker crust, ice cream pie, martha stewart. Bookmark the permalink.